I read the article and was so mad (at the article, not the client…I was thankful they sent it). The article was the epitome of diet culture’s version of IE (aka a diet)! I’m not linking to it here because I don’t want to send any additional traffic its way. The article actually had very little to do with IE and was instead the “eat when you’re hungry stop before you’re full diet.” Stuff like that makes my blood boil. It’s wrong. It’s not what intuitive eating is, and it’s harmful! IE is so much more than hunger and fullness. 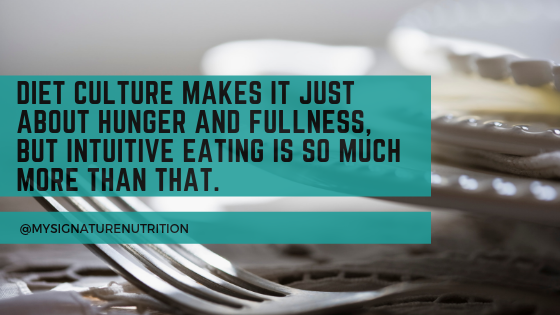 To be clear, hunger and fullness are part of intuitive eating- but only part. Rejecting diet culture, challenging the food police (i.e. diet culture food rules), full permission to eat all foods, seeking satisfaction, building body respect, and self compassion are also integral parts of IE. It’s all these parts together that create intuitive eating. Not one. 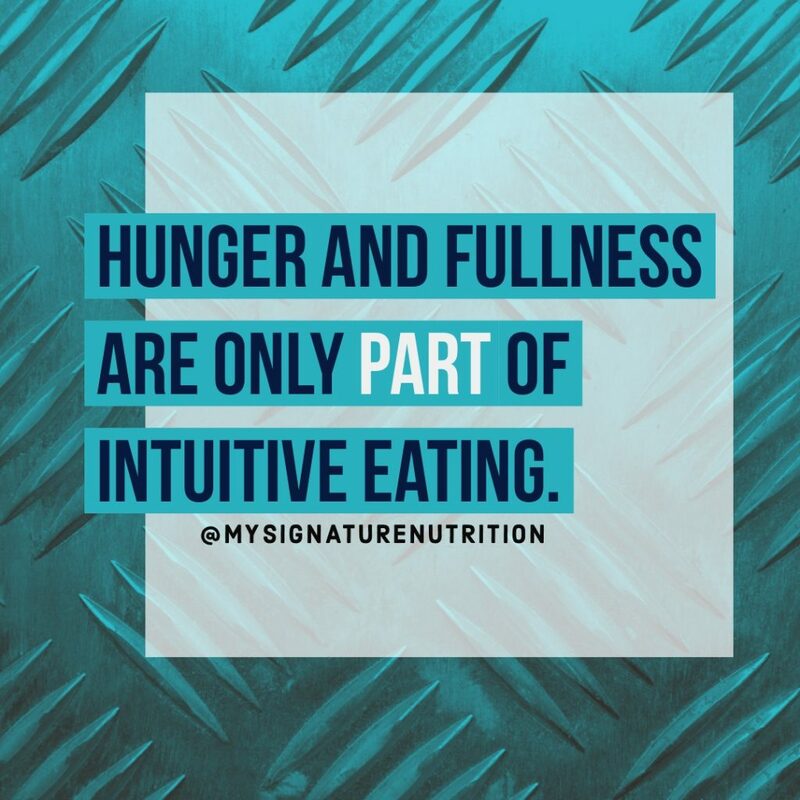 In reality hunger and fullness are only a tiny part to become an intuitive eater. I mean the book has only one chapter on hunger and one chapter on fullness. That leaves 15 other chapters (I double checked) on other principles and supporting material that are just as, if not more, important. If it was only about hunger and fullness then there would be two chapters and that would be it. The diet culture version of IE focuses solely on hunger and fullness. This approach creates rules around when you should eat- which makes it just another diet. It says if you’re not hungry then you can’t eat (not true with IE) and that you must stop when…wait for it…neutral. This article didn’t even mention getting to fullness (to be fair, the article did say to eat to “full” but what they described as full was actually absence of hunger). This just simply isn’t true with IE. IE encourages exploring body cues and responding. It’s also flexible and allows for eating when not hungry and even eating past fullness. If you followed what this diet culture article recommended then you’d chronically be hungry and constantly thinking about food. It’d be like stopping at the gas station and filling your car up enough so that your gas light goes off. That’s not going to get you very far. And it’s not going to help you heal your relationship with food either- which is an integral part of IE. IE goes beyond hunger and fullness to help you “make peace with food.” A fundamental part of healing your relationship with food is permission. And that includes permission for all foods. Not just some foods. This article said that IE was “consuming when hungry, stopping when full, and not restricting certain types of food” NO. NO. No. No. No! IE includes permission with all foods. ALL FOODS. It’s imperative that intuitive eating creates space for all foods to be included because: it’s how you make peace with food. It’s how food becomes neutral again. It’s how you stop your love hate relationship with food. It’s how you stop feeling guilty after eating. It’s how a cookie is emotionally equivalent to kale salad. It’s how you can eat and be free. It’s how you don’t feel tempted to eat all the candy just because it’s there. It’s how food loses its moral value (and in turn how you don’t feel good or bad after eating). It’s imperative that intuitive eating creates space for all foods to be included because: it’s how you make peace with food. It’s how food becomes neutral again. It’s how you stop your love hate relationship with food. It’s how you stop feeling guilty after eating. It’s how a cookie is emotionally equivalent to kale salad. It’s how you can eat and be free. It’s how you don’t feel tempted to eat all the candy just because it’s there. It’s how food loses its moral value (and in turn how you don’t feel good or bad after eating). IE also involves rejecting diet culture and challenging the normalized thoughts and beliefs about food that are rooted in disorder. Rejecting diet culture is an integral part to making peace with food. If you continue to hold onto your food rules then food remains good or bad, full of fear, and out of control. When you approach IE with restriction (aka diet culture food rules that only focus on hunger, fullness, and permission of some foods) then it’s just another diet. With this diet culture approach you’ll end up missing the amazing benefits of IE (and there are a lot that you can read about here) because you’ll still be stuck on the diet cycle. The watered down, diet culture version of IE is downright dangerous and harmful. (I’ve written about it here and here before.) The problem with the diet culture version of IE- as written about in the article my client sent- is that someone reads the article, thinks “Oh I’ll try that” and then it doesn’t work. They fail because they approach it as another diet. This is harmful because they believe they’ve tried IE and it didn’t work. They either move on to their next diet (stay stuck in the dieting cycle) or give up hope all together. IE is often the last straw for many people. It’s where they end up because they’ve hit diet rock bottom and cannot go on another diet ever again. It’s where they’re miserable confused, overwhelmed and have no clue what to do. When IE is peddled as just another diet, it hurts the most vulnerable people. Instead of finding hope and freedom from food they end up feeling stuck and like they have nowhere else left to turn. It’s even more harmful when professionals are promoting a diet but calling it IE. That’s the case with this article. It was written by 2 RDS! Even more concerning was that the targeted audience was personal trainers. Now there’s a whole group of health care professionals who think they understand IE but only have a watered down, diet culture version that will cause harm. I find it even more appalling that the article cited research for IE (and there is a lot of research to support it) but didn’t understand that what they were writing about as IE wasn’t actually IE. If you ever hear your trainer, coach, dietitian, doctor, health care professional or any person in general talk about IE in terms of eat when hungry and stop when full and that’s it- then beware. It might be this watered down version of IE (aka a diet) that does more harm than good. To find a professional trained in IE check out this website. *I am a member of amazon affiliates and by purchasing items through the above link I receive a tiny commission.